When your plant is in need of rivets, it is important to ensure that you have the right parts for the task at hand. While, a variety of different types of rivets is available, some rivets are better suited for certain tasks than others are. For instance, heavy structural rivets often require that one end of the rivet be hammered into shape. In other instances, a lighter rivet, such as a blind rivet may be required. Solid rivets, also sometimes referred to as structural rivets, are comprised of a half-rounded head and straight, round pin. In order for these types of rivets to be installed, a hole must be drilled through both of the pieces of material. The blank is hammered into place in order to pull the two pieces of material together. This works to form a secure joint. With solid rivets, the material must be accessed from both sides. Blind rivets tend to be more complex than solid rivets, but they do offer the benefit of being easier to install. This is because blind rivets can be installed from only one side of the material. They are typically best for lighter applications. Comprised of a hollow tubular pin, blind rivets feature a head on one end that is not unlike a solid rivet. 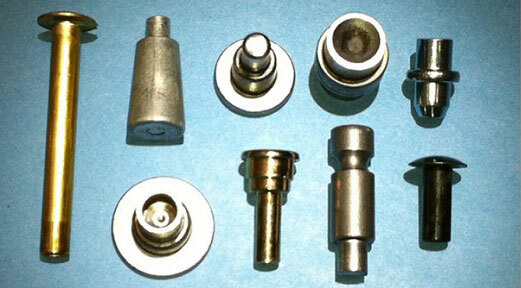 There are also other types of rivets available, including semi-tubular rivets and drive rivets. The skins for aircraft are often attached with the use of very specialized rivets that are countersunk in order to ensure that there is the least amount of aerodynamic drag possible during flight. In some instances, self-piercing rivets may be required. These types of rivets do not require holes to be pre-drilled. Instead, they pierce the material on their own during the installation process. While many rivets are intended to serve a functional purpose, in other cases, rivets may be purely decorative. In such instances, the choice of finish is crucial when choosing rivets. In order to ensure you find the right rivets for your needs, it is important to work with an experienced rivet supplier.